Home Low-carb N-DIVE OR ON-DEEV? California Endive Farms was one of the sponsors of the 2013 International Food Bloggers Conference this year in Seattle. They provided packages of fresh Belgian-style endive to all the attendees. They also filled an embarrassing gap in my culinary knowledge that has kept me from ever discussing endive in public: Is it pronounced N-dive or On-deev? It turns out that both are correct because there are two different kinds of endive. N-dive is a curly member of the chicory family, similar to escarole and frisee, which is grown outdoors. On-deev, pronounced with a French accent (Hercule Poirot would say, “No, no, Madam, it should be spoken with a Belgian accent!”), is a chicory cousin, one that must be grown in complete darkness under cool and moist conditions to produce its characteristic, tightly-packed, bud-shaped heads. It is frequently used as a scoop for dips, making it a handy, low-carb cracker replacement, but this recipe masks the natural bitterness of endive to make a beautiful, fragrant vegetable dish. In a large non-metallic bowl, whisk together the marinade ingredients. Add the endive and toss. Set aside at room temperature to marinate, stirring occasionally, for 30 min. Bring a grill to medium heat and lightly oil the grate OR preheat broiler and place endive on lightly greased broiler pan. Grill or broil the endive with the cut side toward the heat source until lightly charred, about 8 to 10 minutes.. Turn, brush with any remaining marinade, and cook until just beyond the al dente stage and lightly charred, another 8 to 10 minutes or so. Serve warm. Recipe inspired by California Endive Farms. *Herbs de Provence can be purchased as a pre-mixed blend from the bulk bins at most groceries, where it will be much cheaper than the versions in small jars on the spice aisle. Use one that includes lavender for this recipe. (My recipe for making the herb blend is in Nourished and in Low-Carbing Amond Friends, Vol. 3). 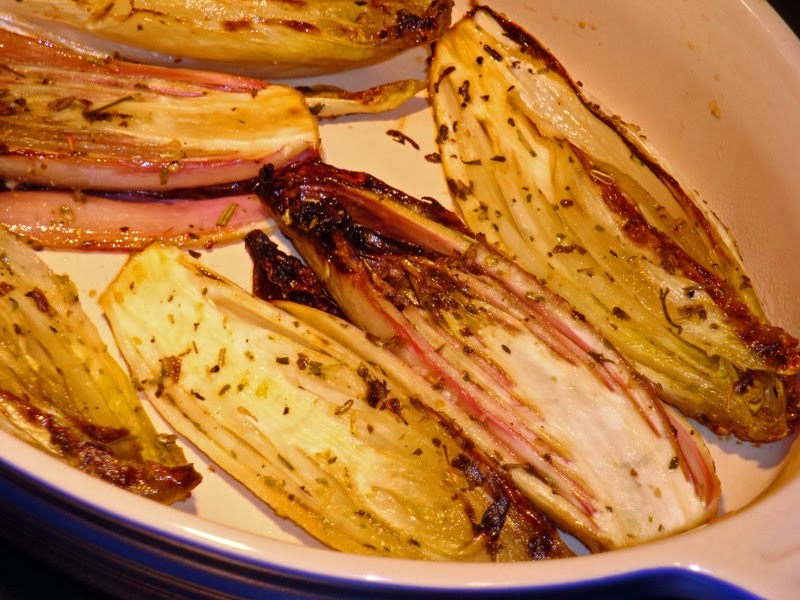 See more recipes for endive here. Disclaimer: I received A free sample of the product reviewed above. 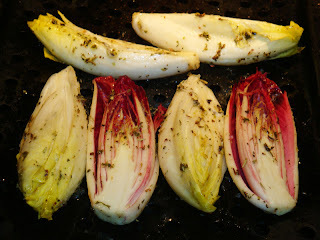 Grilled Endive, Herbs de Provence. Bookmark. You can always call it, as do the Flemish and the Dutch, witloof (or witlof), which means white leave.